Fresh from a relatively easy 2-0 whitewash over minnows Ireland, India’s real test on the tour will start on Tuesday when the Virat Kohli-led brigade will be up against a formidable England side in the first of the three-match Twenty20 International series at the Old Trafford here. While India has been a consistent limited overs side over the past 6-7 years, England has of late lifted their game in coloured clothes by miles, thanks to a group of fantastic limited overs players like Jos Buttler, Jason Roy and Ben Stokes. Going by current form, both sides are at par on paper, with India having won 15 of their last 20 T20 Internationals, including the Nidahas Trophy in Sri Lanka and the bilateral away series against South Africa. England, on the other hand, will head to the series on the back of a 6-0 drubbing of Australia with Buttler, Roy, Jonny Bairstow in good form. 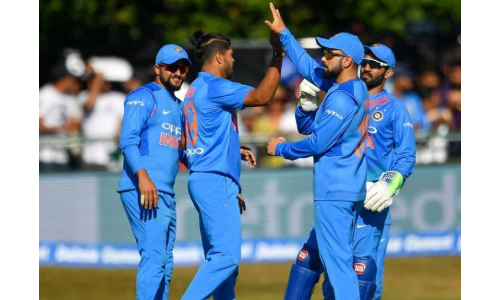 Regrouping after almost a three-month long gap, India used the Ireland T20Is as a good warm-up, registering facile wins of 72 and 143 runs but more importantly giving the whole squad good game time before the challenging series against the Englishmen. Going into Tuesday’s series opener, India is expected to play around with set combinations which means Shikhar Dhawan and Rohit Sharma teaming up at the top of the order. With veteran Suresh Raina in great hitting form at No.3, and skipper Kohli at No.4, it will be interesting to see if the team management includes the in-form Lokesh Rahul in the middle order. All eyes will also be on the former skipper Mahendra Singh Dhoni, who was in great touch in the Indian Premier League (IPL) for eventual champions Chennai Super Kings. On the bowling front, Jasprit Bumrah’s thumb injury will be a concern as he has played a big role with his death overs bowling. It will be interesting to see whether his replacement, Deepak Chahar, gets his maiden cap even though senior pro Umesh Yadav looks a more likely replacement. Wrist spinners Kuldeep Yadav and Yuzvendra Chahal have proven their worth in Ireland and look certain to play. England, meanwhile, made a few strategic changes by putting assistant coach Paul Farbrace in charge of the T20 team for the Australia and India series, while head coach Trevor Bayliss simultaneously took to domestic cricket scouting. England’s recent ploy to promote Jos Buttler as an opener worked in fine fashion as he struck the quickest T20I half-century by an English batsman, with a 22-ball 50, that included six fours and five sixes against the hapless Kangaroos. Buttler continued from where he left in the IPL, where he struck five successive half-centuries for the Rajasthan Royals and finished the tournament with 548 runs from 13 matches at a strike-rate of 155.24. Needless to say, he will be India’s greatest threat, albeit the likes of Roy and Alex Hales also add a lot of firepower to the English top-order. India: Virat Kohli (Captain), Shikhar Dhawan, Rohit Sharma, Lokesh Rahul, Suresh Raina, Manish Pandey, MS Dhoni (WK), Dinesh Karthik, Yuzvendra Chahal, Kuldeep Yadav, Krunal Pandya, Bhuvneshwar Kumar, Deepak Chahar, Hardik Pandya, Siddarth Kaul, Umesh Yadav. England: Eoin Morgan (Captain), Moeen Ali, Jonny Bairstow, Jake Ball, Jos Buttler (WK), Sam Curran, Tom Curran, Alex Hales, Chris Jordan, Liam Plunkett, Adil Rashid, Joe Root, Jason Roy, David Willey, Dawid Malan.